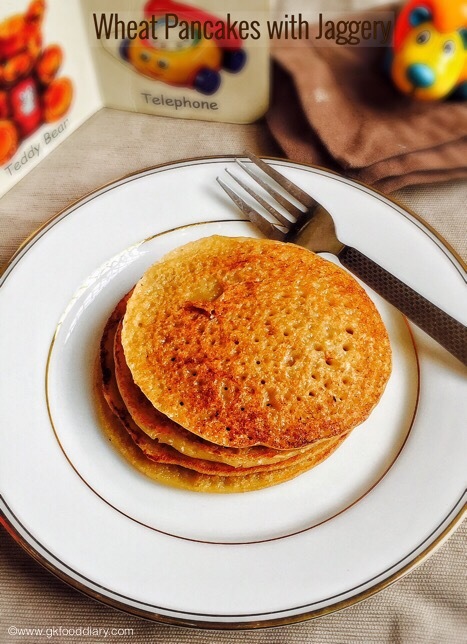 Wheat pancakes - Indian Style wheat pancakes(sweet wheat dosa) recipe with wheat flour & Jaggery. Easy and healthy breakfast/dinner for babies & kids. Measure wheat flour & Jaggery. Keep it ready. Take jaggery in a sauce pan & add water till it immersed level. Heat the jaggery until it melts completely. Strain the jaggery water using a strainer to remove impurities. Set aside. In a vessel, add wheat flour, jaggery water, scrapped cocount and mashed banana. Add water little by little and mix wel so that no lumps are formed. The batter should be like regular dosa batter consistency neither too thick nor runny. Set aside. Heat a dosa tawa, add a laddle of batter to it and spread it to form a circle. Don't spread too much. Sprinkle ghee or oil. Cook until brown on one side for five minutes and flip the dosa. Cook for a minute and remove from tawa. Repeat the same process for the remaining batter.